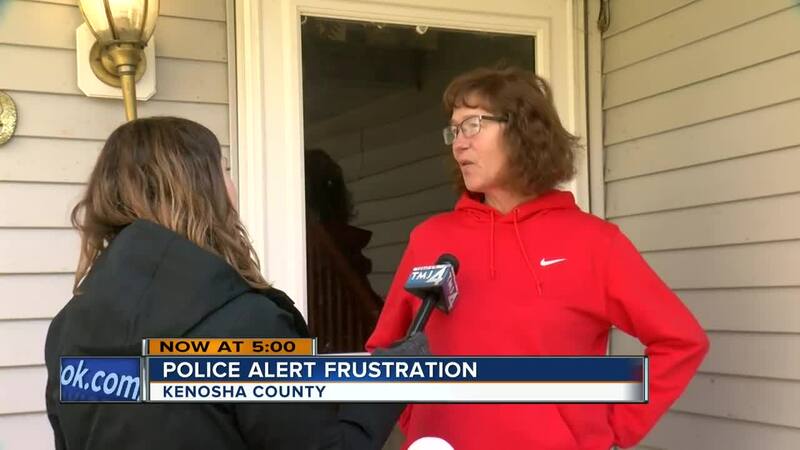 The Kenosha County Sheriff's Department sent out a warning Monday night about a potentially dangerous situation in Pleasant Prairie, but some nearby neighbors said they never got the message. "It was a little freaky... It said that they had somebody barricaded and to stay in doors and not come out," said Mary Farmer. "So we thought just lock the doors just in case," said Farmer. Scott Drews lives near the border of Pleasant Prairie and said he didn't get the alert, but his neighbors did. "Something like that's a really big deal and we want to make certain we're all protected," said Drews. Drews didn't know he needed to sign up. "I called one police department and got sent to another police department and then got pointed to a website," said Drews. Another neighbor, Ed Gray got the alert, but says they're inconsistent. "I'll get it and my wife won't. She'll get it, I won't. Neither one of us will get it," said Gray. Kenosha County Sheriff David Beth said the alerts strategically don't go out to everyone. "The AlertSense only goes out to cellphones in the geographical area and people who've signed on to it," said Beth. This leaves some neighbors wondering if they can rely on the emergency alerts. "So the truth is I don't know," said Drews. Police arrested one person following the standoff. No officers or residents were hurt. Click here to sign up for alerts.